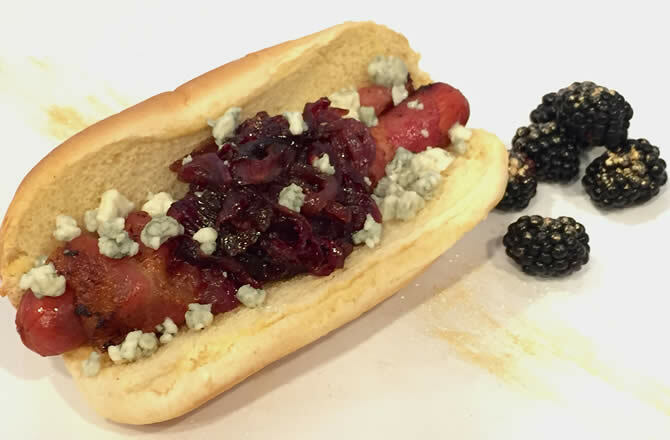 Glam it up with a few gourmet ingredients and a bit of pizazz…This is no ordinary hot dog! Recipe created especially for Hoffy by Chef Jamie Gwen. Heat the olive oil and butter in a large sauté pan over medium heat. Add the onions and cook, stirring often, until they are tender and beginning to caramelize, about 15 minutes. Season the onions liberally with salt and pepper and cook for 5 minutes more. Add the Crème de Cassis, Grenadine and red wine and cook over medium-low heat, stirring occasionally, until the onions and brown and glazed, about 15 minutes more. Grill the Hoffy Bacon Wrapped Hot dogs over high heat or roast in the oven at 350ºF, turning often, until the bacon is crisp all over. To assemble the dogs, toast the buns until lightly golden. Place a Bacon Wrapped Hoffy Hot Dog in each bun and top with a 1/4 cup of the Cassis Caramelized Onions. Sprinkle 2 tablespoons of the crumbled Gorgonzola over the onions and drizzle each dog with 1/2 teaspoon of truffle oil.